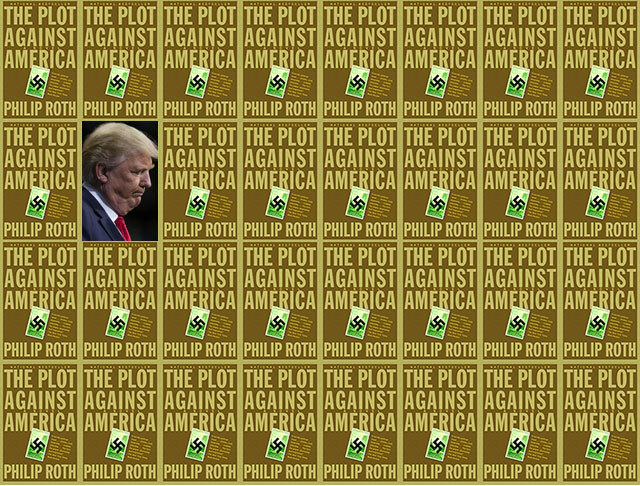 Philip Roth’s 2004 novel, The Plot Against America presciently predicted the rise of American fascism. An alternate history set during the 1940 presidential election, the character of Philip Roth narrates the story of his family living in Newark, New Jersey as Charles Lindbergh challenges the presidential election of Franklin Delano Roosevelt, and the aftermath of a fascist President. Lindbergh wins, transforming Philip’s world in a frightening way that should serve as a warning to changes coming under a Trump presidency. The events of the novel are frighteningly similar to those transpiring today. During the course of the Lindbergh campaign, many people normalize his racism, as the media did with Donald Trump. Like Jared Kushner normalizing Trump’s anti-semitism, rabbi Lionel Bengelsdorf normalizes Lindbergh. Lindbergh wins on a wave of racist, xenophobic populism, as did Trump. Throughout the novel, Lindbergh flies around the nation hosting rallies, once more drawing a parallel to Trump who plans to tour the nation as though he is campaigning and who hopes to have military parades celebrating himself. They are both charismatic showmen accustomed to performance rather than substance. Also like Trump, Lindbergh has the aid of a hostile foreign power, though it’s Germany rather than Russia. Germany uses fake news to further fuel anti-semitism when Lindbergh’s airplane disappears, not unlike Russia’s propaganda system generating fake news stories. And like the Trump dossier suggesting Russia is blackmailing Trump, one hypothesis suggests Lindbergh’s kidnapped son was raised in the Hitler Youth, and Germany holds the boy hostage to manipulate Charles. There are lessons here. Philip’s family is quickly divided by Lindbergh. His father, a blowhard, afraid of the rise of fascism and the Axis powers in Europe, insists Lindbergh is the new Hitler. Cousin Alvin joins the Canadian army to fight in Europe against the Nazi armies and returns bloodied and mangled. He becomes a symbol for those who support Lindbergh’s decision to remain neutral in the war. Not all of Philip’s family are convinced of the Nazi threat. Philip’s aunt Evelyn ends up marrying rabbi Bengelsdorf, and wholly accepts Lindbergh as normal, and so does Evelyn. His brother, Sandy, enthusiastically embraces his selection as part of a Jewish youth program meant to decentralize American Jews. The shift in Lindbergh’s America is swift and sudden. A family trip to Washington D.C. is interrupted when a hotel refuses service to the Roth’s because they are Jewish. At the time, refusing service to blacks and people of color was acceptable, but the Roth’s find it unpleasant and disturbing that their white status is suddenly open to being challenged once Lindbergh takes office. Lindbergh’s also government leverages businesses in the country to pressure Jewish families out of protective enclaves into the rural parts of the nation. Philip’s father loses his job when he refuses to relocate. Many of Philip’s Jewish neighbors escape to Canada. The Roth’s wait too long, and are unable to leave, a reminder that cautious optimism will not protect you. Democracy, liberty, and freedom are eliminated. The Ku Klux Klan murders prominent characters, opposition leaders are assassinated, and eventually Lindbergh’s airplane disappears. With the disappearance of his airplane, Prominent Jews, including Mayor La Guardia, are arrested for a conspiracy that doesn’t actually happen. Again, it’s probably worth noting the real America did do this in large numbers with Japanese-American citizens during the war. There is hope. The disappearance of Lindbergh’s plane effectively ends his regime. Attempts by the Germans to smear Jews ultimately are ineffective, and Roosevelt wins an emergency election. At the time the novel was published, America was deep in the W. Bush years. Recession and terrorism were first and foremost in national discussions. The New York Times even went as far to say, “The Plot Against America is not an allegorical tract about the present age, with each scene or character corresponding to events of our own time.” And yet, now, a little more than a decade later, here we are. In the dawn of the neo-fascist regime in the United States, it seems actually that a suspension of common sense must have been required not to read Roth’s novel, but to live and function in America.